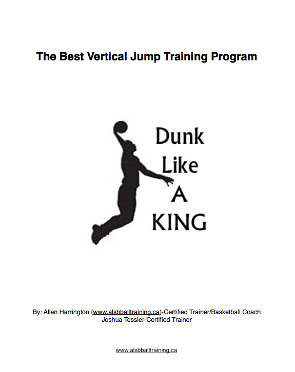 This book was created by myself with the input from Joshua Tessier who is a very well known vertical jump trainer here in Canada. The players averaged a 12 inch increase who used this Jump Training Program through the creation of the Program. Is This Program Safe For Kids? This program was tested on kids aged 11 and up and is safe for anyone over the age of 6. Younger boys and girls using this program should start on level 1. If your under 10 I would suggest running through the program but cutting the reps in half. After purchase of the Jump Training Book you will be redirected to the view/download page. Also within a few hours you will also be emailed a download link for your records and future downloads. "At the end of the pool workouts I felt amazing, I have learned just how great a pool workout can be for you. There is hardly any impact to the knees which is great! My muscles were tired and my ankle never hurt" I gained 5 inches with the pool workout in 12 weeks. "I just finished the 24 week land program and during the last few weeks I combined the land and pool training. During the first 12 weeks I gained 9 inches and the last 12 weeks I gained 5 inches. I have always wanted to dunk, before I could hardly touch the rim and now I can throw down a DUNK, I am very pleased". I gained 17 inches in 24 weeks! "I am pleased with this program, my parents didn't think I was going to gain much due to my age but I was able to prove them wrong" I gained 6 inches in 24 weeks.